As the sport of beach volleyball becomes more popular, the athletes competing should be aware of the affects that heat has on the body and sports performance. Especially those athletes that live in the Midwest where the weather conditions change from the snowy cold to hot, sunny days. Being aware of heat exhaustion preventative strategies can not only reduce heat related illness but it can improve sports performance. Thermoregulation is defined as the body’s ability to regulate temperature under normal conditions. The stress of environmental heat combined with physical exertion can be a burden to the body’s ability to self-regulate temperature and adversely affect performance. Below are three strategies you can use to optimize your performance in the heat. Appropriate hydration and electrolyte replacement—Start by drinking a sufficient amount of water the night before competition and make sure your urine is clear. For the day of competition 17-20 oz. of water 2-4 hours before exercise and 7-10 oz. of water 10-20 minutes before is recommended. Because of electrolyte loss during sweating, sports drinks are more effective for fluid and electrolyte replacement. Gradual acclimatization and heat training –Don’t just go and compete without training in the heat. It is recommended that graded exposure to competing in the heat occur over 7-10 days. Check out the National Athletic Association consensus statement “Preseason Heat acclimatization guidelines for high school athletes” for detailed recommendations. Keep Cool – When overheated, the body will shunt its blood to vital organs. That means that the muscle groups needed to pass, defend and attack the ball won’t get the blood they need. When not competing, make sure to take shade and rest your body. Bring an umbrella with a lawn chair or find some shade under a tree to help your body maintain a normal body temperature. You can also bring a cooler with wet towels to place on the back of your neck. If you have any questions or would like help implementing this regimen into your training don’t hesitate to reach out to one of our physical therapist at any of our Orthology locations. “Exercise in Hot and Cold Environments.” Physiology of Sport and Exercise, by W. Larry Kenney et al., 5th ed., Human Kinetics, 2012, pp. 283–285. “Environmental Considerations.” Arnheim’s Principles of Athletic Training: a Competency-Based Approach, by William E. Prentice and Daniel D. Arnheim, 14th ed., McGraw-Hill Higher Education, 2011, pp. 151–155. 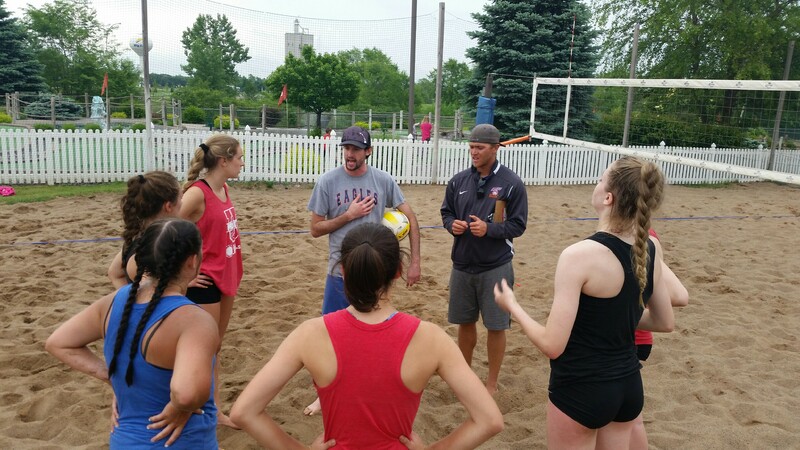 A couple weeks ago, I joined Jack Davis of US Sports Camps/Nike Volleyball to talk about the rise of beach volleyball within younger indoor volleyball players. Some of the areas covered include: the benefits of playing both indoor and beach, the common myths related to beach, the why playing on another surface will develop your overall game. For the entire interview, visit here. 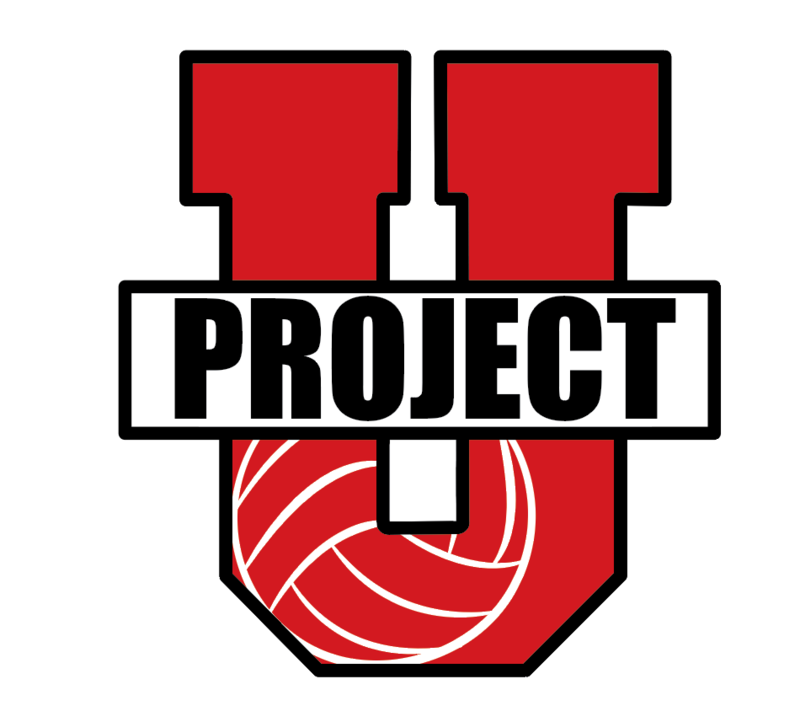 Our ProjectU Beach House Camps are on and off court overnight camps that include creative on-court skill development training, as well as, experiential learning and competitive cauldron games, nutritional seminars, and speed development training off court. The event is open to all athletes who are committed to understanding themselves and moving ahead as a player and a person and per NCAA rules, this event is open to any and all entrants limited only by age, gender, grade, or number. Tampa Bay: Tulane University, Georgia State University, Houston Baptist University, Florida Atlantic University, Florida Southern, and University of Tampa. Tampa Bay (June): Tulane University, Houston Baptist University, Texas Christian University, and University of Tampa with more to be announced. Santa Monica (July): Oregon, Houston Baptist University, Tulane University, Texas Christian University, Missouri State, and Stephen F Austin with more to be announced. 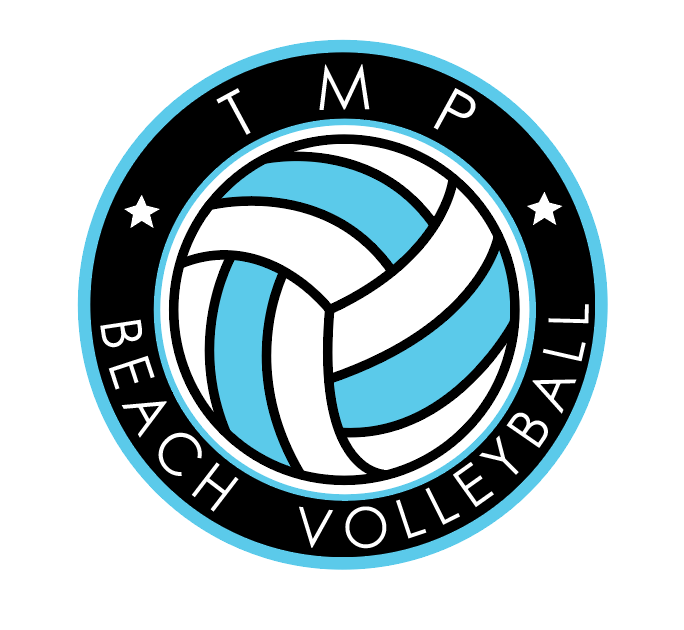 Stephen McCarthy, Director of TMP Beach and AVP Academy Camps and Clinics, has prepared over 15,000 youth, high school, college athletes for over a span of 18 years. He has trained players who have played the following professional sports: NBA and NHL. He has developed over 150 college athletes within the sports of basketball, volleyball (indoor and beach), soccer, swimming and hockey. Currently, Stephen is a USAV certified official, a USAV Beach Impact and BCAP I certified volleyball coach, a member of AVCA, a sponsored JVA beach club, as well as, a ISSA certified personal trainer and fitness nutrition consultant. The sport of volleyball is on the rise and there are more and more youth participating at younger ages. As the number of participants increase, so does the number of injuries. According to the NCAA, the knee and ankle are of the most common body parts injured in the sport of volleyball. Of all of the skills involved within the sport, attacking or spiking has been found to have the greatest risk of lower leg injuries because of poor control of mechanics during jumping/landing. With the growth of the sport and the number of hours spent participating, it is important to establish an exercise prevention program in order to decrease the risk of jumping and landing injuries. Neuromuscular/balance training and glute strengthening have been found to be one of the best additions to any injury prevention program. Incorporating this type of training into volleyball movements just 15 minutes a day can successfully decrease the risk of ankle and knee injuries. Below is a list of 10 exercises that can be used to optimize lower extremity injury prevention. Incorporating a multifaceted program that includes both glute strengthening and balance/jump training can significantly lower the risk of injury. It is important that when implementing these movements that proper biomechanics are used. If you have any questions or would like help implementing this regimen into your training schedule don’t hesitate to reach out to one of our physical therapists at any of our Orthology locations or call 763-315-0466. The AVP Next and AVP First tournaments are coming to Duluth, MN! Check out these interviews that our hosts at Skyline Lanes did with Fox21 and ABC 10/13 Duluth! Our hosts, Corey Kolquist and Megan Bell of Skyline Lanes, had the opportunity to talk with Fox21 about the AVP tournament being held later this month in Hermantown. Click here for Corey and Megan’s appearance on Fox21. ABC News Press Release: Duluth, MN: Volleyball players are taking over Skyline Lanes in Hermantown later this month for a pair of AVP tournaments. AVP is a US professional beach volleyball league that features elite players from all over the country. The AVPFirst tournament is on Saturday, May 26. Age divisions here include 14U, 16U, and 18U. General Manager of Skyline Lanes, Cory Kolquist, says The best young players from around our region and down in the Twin Cities are among those registered to compete. Then, on Sunday, May 27, the AVPNext tournament will take place. AVP says this is where elite amateur players earn qualification points as well as an opportunity to earn professional points. Teams of two will square off against each other. There will be a Men’s and Women’s Open division. For more information about these events, check out the AVP First Duluth and AVP Next Duluth pages. 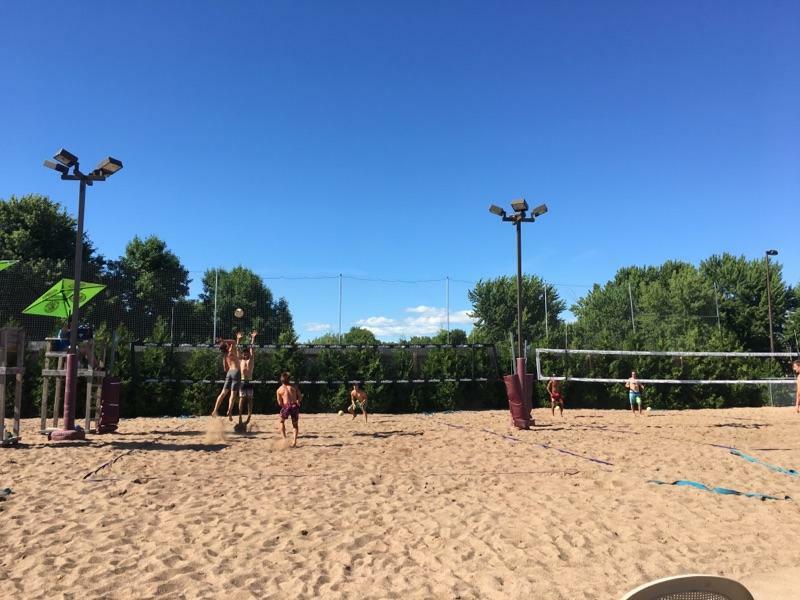 We’re excited to bring beach volleyball to Duluth! NCAA Beach Volleyball Tournament: UCLA Bruins, 2018 National Champions! 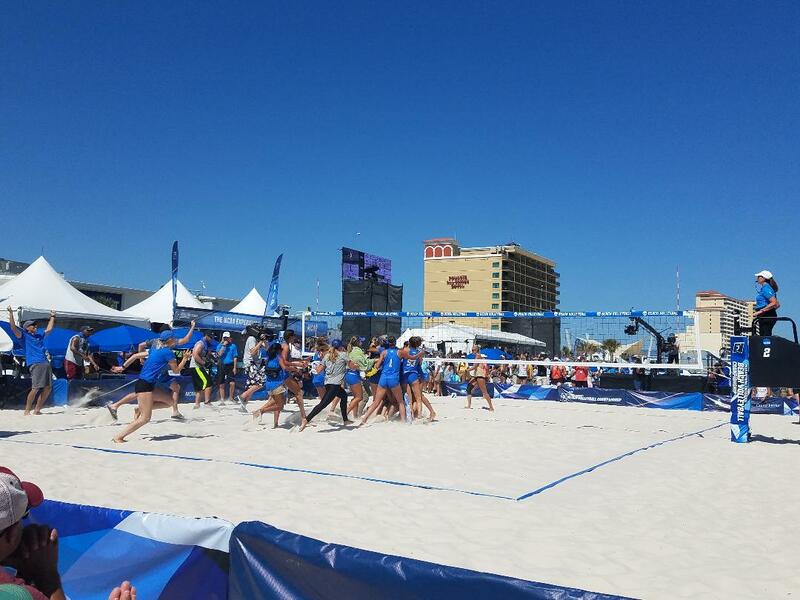 Gulf Shores, AL: UCLA’s all-around game proves too much for Florida State Seminoles’ power. 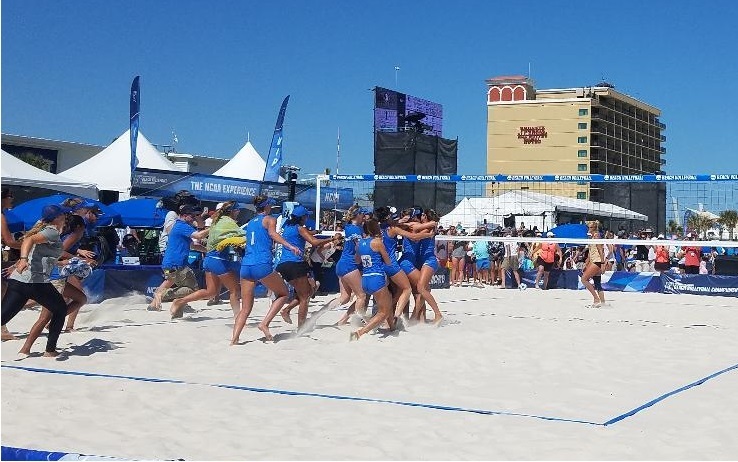 UCLA cruises to the their first NCAA Beach National Championship. In the day’s first match, UCLA narrowly escaped from a tenacious and determined Hawaii team. With UCLA leading 2-1, Hawaii needed a set win on court 2 to stay alive. Lea Monkhouse and Morgan Martin of Hawaii delivered a 25-23 win. After the final set point, the entire crowd sprinted to court 3 to see if UCLA would advance or Hawaii would extend the match. UCLA came from 9-5 down to even the 3rd set at 11, but Hawaii closed out the match to even the dual at 2 a piece. Attention turned back to the court 2 third set, the winner would advance to the finals. UCLA’s Lily Justine and Sarah Sponcil took 8 of the final 12 points to win the match and the dual for UCLA. The finals match was a showcase of UCLA’s offensive and defensive skills from the start. UCLA jumped out to a quick lead to neutralize Florida State’s big home court advantage. UCLA continued to keep the pressure up on every court with Florida State never seeming to gain any momentum. In the end, UCLA finished off Florida State in classic beach volleyball style; creative and aggressive shot-making and great athletic touches on defense. 1. UCLA: Nicole and Megan McNamara, The combination of tough jump serves, running the option offense to perfection, and gritty defense lead the Bruin’s match after match. During the entire weekend, the twins did not make many unforced errors and when another pair challenged them, they responded with a great touch, a big serve, or a creative attack to turn the match in their favor. Hawaii and Florida State Go toe to toe. 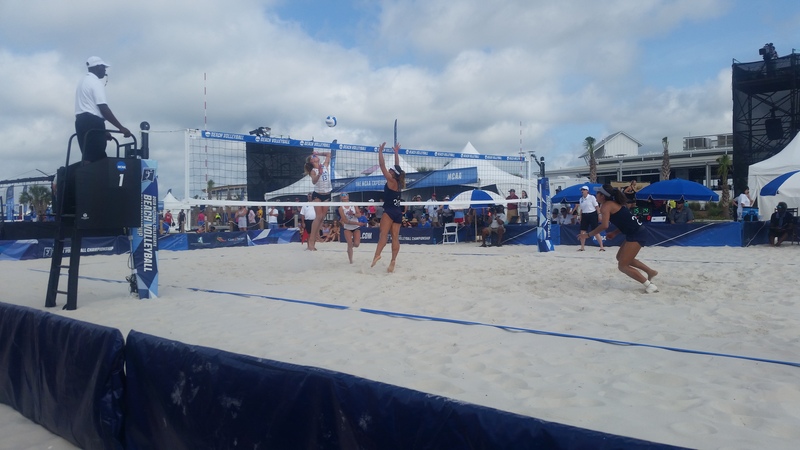 Gulf Shores, AL: The intensity of Day 2 at Gulf Shores started as soon as California rivals USC and Pepperdine squared off in the first match, in which, USC prevailed and eliminated the number two seed Pepperdine. After being upset in Day 1, UCLA returned to the court with an edge and moved quickly past LSU and USC on the day. But the dual of the day was Florida State and Hawaii took the courts. With the help a raucous home crowd, Florida State took 3 of 4 third sets to win the dual and punch their ticket to the finals. With Tallahassee a short 3 hour drive from Gulf Shores, AL, the atmosphere was decidedly pro-Florida State. A slow start by Hawaii in 4 out of the 5 matches made it look and sound like it would be a blowout, but Hawaii rode out the crowd and took a small lead into the second sets. The tables continued to turn in Hawaii’s favor as Hawaii traded set wins and winning one match. With four of the five matches going three and the FSU faithful sprinting from court to court to court to watch the third sets. It came down to a windy court 5, Madison Fitzpatrick and Francesca Goncalves of FSU prevailed 15-12 to advance the team, 3-2 to the finals. With the loss, Hawaii-UCLA will play for a chance to play FSU in the finals. 1. UCLA: Nicole and Megan McNamara, It is not that they win, it is how they win. The pair show a big serve to win points, come back with big touches and great sets to unleash an array of creative attack shots that, more times than not, land in their intended spot. A unique pair of creative young players and the best team in the tournament. 2. USC: Abril Bustamante and Tina Graudina, decidedly improved from Day 1. Abril played with an injured hand and the pair blistered LSU and UCLA with power and solid defense. In second match, Abril and Tina went toe-to-toe with the McNamara’s. The match ended all square, 17-17 in the third set, when the match was called as UCLA advanced to the next round. 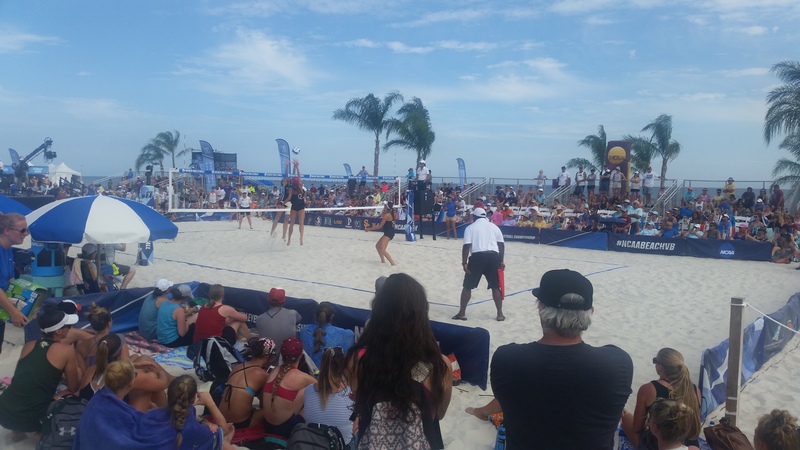 Gulf Shores, AL: Day 1 Action at the 2018 NCAA Beach Championships was a combination of great weather, top teams in the nation and one of the best beach volleyball venues in the United States. The top seeds won their first round duals easily. The first upset of the day occurred when Florida State broke top-seeded UCLA’s 30 dual win streak in a very close match and then number two seed Pepperdine lost to three seed Hawaii, 3-2. The day started under sunny skies and gusts of wind up to 15 mph off the Gulf of Mexico. Each of the 8 teams played an opening round with the top four seeds winning each of their duals. In the winners bracket, Florida State controlled the match from the beginning, taking 4 of the 5 first sets from UCLA. UCLA stood up and started to mount a comeback that was too little, too late, they had dug a hole too deep to overcome. Hawaii and Pepperdine’s dual was much different. Hawaii made the initial move in the first sets, but Pepperdine clawed back to win 3 of the 5 first sets. During the second sets, Hawaii turned the tables and won 2 of the 3 matches with courts 4 and 5 going to a third set. Ultimately, Hawaii’s Paige Dreeuws and Hannah Zalopany prevailed 15-13 in the third to win the dual for Hawaii. 1. Hawaii: Ka’iwi Schucht and Emily Maglio, a traditional beach volleyball pair of a big blocker/big power and a great defender. They ground out points with great touches and used the big power when they needed it most. They won both of their matches against South Carolina and Pepperdine. 2. UCLA: Nicole and Megan McNamara, controlled both of their matches with their all-around game. Their great ball control and setting, the occasional big hit and crafty scoring defeated Florida International and Florida State. 3. Pepperdine: Deahna Kraft and Corinne Quiggle, outside of losing a highly contested match against Hawaii’s top pair, Deahna and Corrine won their first match in convincing fashion with their trademark efficient play. They continually had outstanding touches on defense, which lead to scoring at a high level. In the end, a couple unforced errors at the wrong time cost them the match against Hawaii. Gulf Shores, AL: “Sweet Home Alabama” rings true. The top teams in the nation will be making the annual trek to the NCAA Beach Championships in Gulf Shores, Alabama the first week of May. Since 2012, the white sand shores of the Gulf of Mexico have hosted the NCAA tournament, and before the AVCA National Championships. From a pool of 69 NCAA programs, the top 8 teams were selected by the NCAA selection committee to compete in a double-elimination tournament the first week of May to crown the 2018 championship team. This years teams include: UCLA, Pepperdine, Hawaii, Florida International, Florida State, USC, South Carolina, and Louisiana State. UCLA: They have earned the top seed for the first time in their history and are on a 30 match win streak that includes every team in the field. Outside of USC, they have consistently been one of the top 3 teams in the nation and look poised to take the championship this year. The team is a combination of talent and experience with one of their top players, Elise Zappia, becoming the first Bruin player to reach 100 victories in their career. Interesting Fact: Their top team, Nicole and Megan McNamara, are twins and hail from Vancouver, British Columbia. Pepperdine: Carrying a record of 24-3 with 2 of the 3 losses to top seed UCLA, Pepperdine may not have the athletes across the board like other teams, but they always know how to maximize their talents and compete with the best. Interesting Fact: After a legendary coaching career and her involvement in creating the college sport of beach volleyball, Nina Matthies, will be retiring after this season. Hawaii: Head Coach Jeff Hall has the Sandbows on track to compete for Hawaii’s first beach volleyball championship. After a 5-3 start to the season, the Sandbows completed the season with 30 straight victories and won the Big West Conference Championship. In head to head duals with UCLA, they are 2-1. Interesting Fact: Coach Jeff Hall grew up in cold, snowy state of Minnesota. Hawaii and UCLA in the championship with a Hawaii victory, 3-2.